After 80 years in business, Gill's Old Fashioned Ice Cream shop will close at the Original Farmers Market in the Fairfax District. 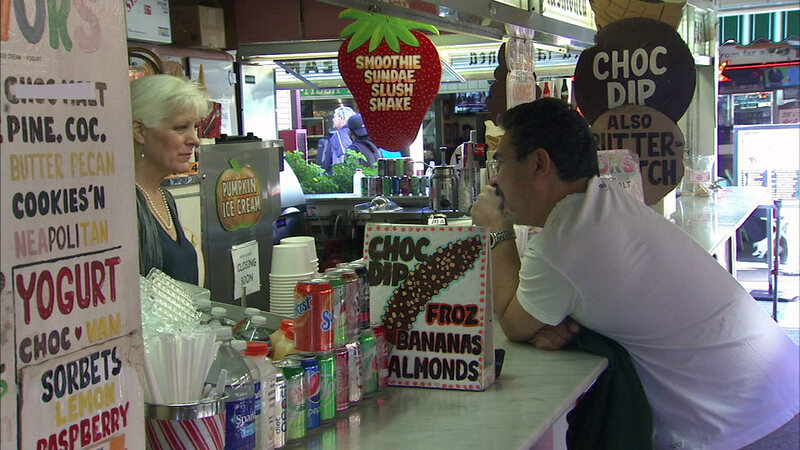 FAIRFAX DISTRICT, LOS ANGELES (KABC) -- After 80 years of scooping ice cream, Gill's Old Fashioned Ice Cream shop is closing at the Original Farmers Market in the Fairfax District. The founder's granddaughter Jody Gill said the Original Farmers Market required the shop to remodel and renovate its stall. She said her father became ill and she fell behind on the remodeling plans. "The Farmers Market never gave me a deadline," she said. "They just called me in and said they were done with me and that my time was up and that they were going to find someone else to lease the spot." The space has been leased to another vendor, according to the Original Farmers Market. A farewell last-scoop party was scheduled at Gill's on Sunday from 3 to 5 p.m.
"Over the last three years, we have been discussing some needed infrastructure repairs with the owners of Gill's Old Fashioned Ice Cream, not specific to their retro decor. After much discussion and encouragement, they chose not to make the necessary changes to their stall infrastructure that decades of use demanded, and that our customers deserve."